The profile of science in the UK must be raised to help diversify the economy and boost growth, a report endorsed by the Conservatives has urged. The report's author, entrepreneur Sir James Dyson, called for more support for science teachers and tax breaks for high-tech firms to conduct research. 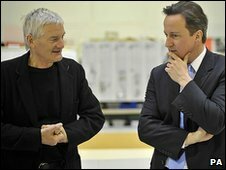 Conservative leader David Cameron, who commissioned the Dyson review, said the UK needed to "start designing things". Ministers say they have boosted the image of science but more can be done. The Dyson report - commissioned by the Tories last year - seeks to set out a long-term vision for high-tech industry in the country, with the goal of making the UK the largest exporter of high-tech products in Europe. The Tories said the report endorsed a number of existing policy commitments, including plans to pay off the student loans of trainee science teachers, flexibility for schools to offer higher salaries to attract physics teachers and a requirement for all state schools to offer three science subjects at GCSE level. Mr Cameron said he could accept "almost everything" in the report, while acknowledging that some recommendations called for more money at a time of a public spending squeeze. Among the report's key recommendations are greater financial and regulatory freedom for universities to promote investment in science and engineering, public-private institutes to help translate research into commercial opportunities and more generous tax relief for investors in start-up and established high-tech firms. It says the existing system of tax relief for companies investing their own cash in research and development should be retained but refocused on small, high-tech firms to "stimulate a new wave of technology". The Tories have, in the past, promised to cut business tax breaks to pay for cuts in corporation tax. The Tories say boosting exports is imperative if a sustainable recovery is to be achieved and a "new economic model" - based on savings and investment rather than debt - is to be built. "It is a massive call to arms and one that I completely welcome to build a new model for our economy," Mr Cameron said. "We've got to have an economy where we start designing things, making things, selling things. "I think we have a choice where we go on as we are borrowing money from the Chinese to buy their products, or we can say 'no - wait - this is actually a country with great design, great scientists, great engineers, let's make sure we are developing products and services and goods we can sell to the Chinese as they get richer'." Labour has accused the Conservatives of focusing too much on cutting the deficit rather than boosting growth, saying its determination to begin cutting public spending this year will choke off the recovery. In contrast, ministers say they are focused on supporting the industries of the future like bio-technology and renewable energy. Ministers launched a series of reviews last year to try to change "cultural attitudes" towards science in the UK. A report delivered to science minister Lord Drayson last week called for more accessible advice on science careers, more work experience for science graduates, for more subjects to be seen as stepping stones for science careers and for eminent scientists to be used as role models.